Art Walk co-founder Sal Campbell helps to hang paintings at one of many locations for Saturday’s Beverly Art Walk. Photo by Holly Donovan. If the posh and chic River North art galleries are quiet Saturday, it’s likely because the city’s art-community will be focused on the far South Side, as the Beverly Art Walk returns for the second year. The Art Walk, which will feature works from 155 artists, (up from 100 last year), is expected to draw several thousand art and music lovers from Beverly and beyond from 12-7 p.m. Saturday. Organized by The Alliance, formerly known as The Beverly Area Arts Alliance, the goal of the Art Walk is twofold: To help local artists gain exposure and make sales and to showcase area businesses and venues, many of which have paid a small fee and allowed artwork to be displayed in their establishments, according to organizers. Alliance co-founder Monica Wilczak, planning for this year’s event started almost immediately after last year’s event, which was the first year of the Art Walk and drew 3,000 people. Wilzcak said that while she and fellow co-founder Sal Campbell did most of the leg work for the first Art Walk last year, a committee of ten people was formed that helped to put together the event this year. The budget for the event, which is free to the public, has doubled this year to $20,000, Wilzcak said. She also noted that the Alliance received an additional $20,000 in in-kind donations from local small businesses and neighborhood families who believe in the value of the work of the Alliance. Most of the venues where art will be displayed and activities will take place are located along Western Avenue from 95th Street on the north to 111th Street on the south, with a few places off the path. Trolleys will be running to help bring attendees from place to place. For a full map, click here. In the event of rain, Wilczak stressed that most displays and activities will be taking place inside and that they have a lot of tents that will be set up. To help put the event together, in addition to the committee and local volunteers, art communities throughout the city have been very supportive, according to Wilczak. For example, the Ed Paschke Art Center in Jefferson Park provided coloring books and crayons for children’s activities, Wilczak said. “The art community is really great at supporting each other. We’ve gotten so much support from the art community and the the small business community,” Wilczak said. 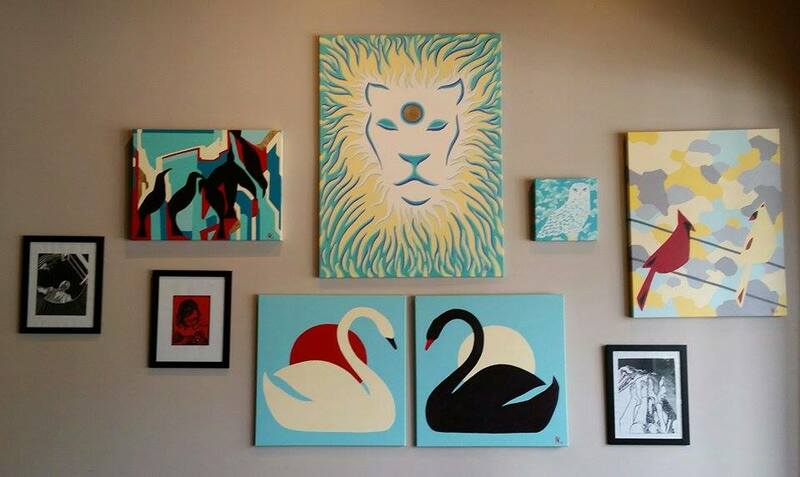 At Horse Thief Hollow Brewing Company, 10426 S. Western Ave., which has supported many Alliance events, artwork from several artists will be on display and it will host an after-party Saturday evening in its parking lot from 7 p.m. to close, according to manager Glenn Byers. He added that the Art Walk is a very busy day for the restaurant and that no employees are allowed to take a day off on Saturday. “We need all hands on deck,” Byers said. The Quilter’s Trunk, 10352 S. Western Avenue, a boutique shop for quilters, sewers and machine embroiderers opened September 28, just in time for the anticipated traffic from the Art Walk. According to manager Lisa Wilberding, the store originally wanted to open a few weeks earlier but experienced some construction delays. Being open in time for the Art Walk however was “quite important,” Wilberding said. The store is one of the participating businesses and will feature North Wind Pottery from artist Pamela Johnson-Howe and also will host a group of singers. 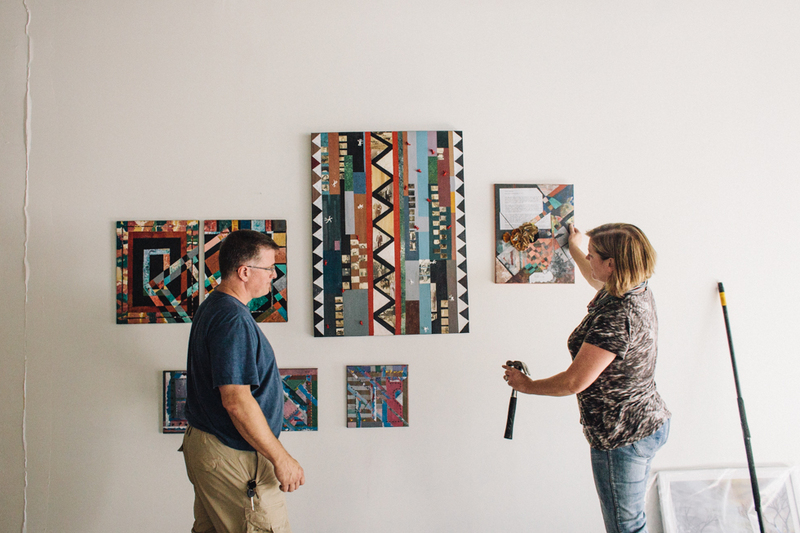 Baird and Sal Campbell help to set up one of many pop-up galleries for the Beverly Art Walk. Photo by Holly Donovan. For the first time, the Art Walk will also feature art work from students, with the work to be displayed at Tooromeen School of Irish Dance, 10344 S. Western Ave. For that project, students from Barnard, Christ the King, Clissold, Kellogg, Morgan Park Academy, Mother McAuley, St. John Fisher and Sutherland created sketches and paintings highlighting beauty and nature. The Art Walk is a family event, with a kids area being set up at King Lockhart Park, 10609 S. Western Ave. There, live music will be featured, along with a “Peace Flag” project — more than 500 small flags that students have created. In addition to the children’s area, the Art Walk will host “The Uprising Craft Fair,” taking place in the north parking lot of County Fair, 10800 S. Western Ave. There, more than 30 artists and artisans will be selling their wares, from handmade jewelry from local artisan Sarah Haskins under the name Que Sera Sarah, hand painted glass by Roberta Mezinskas; handmade “loveables” by Ni Bu, and handcrafted bags by Nicole Sanders and many more. The types of art on display throughout the Art Walk varies, from sculptures and landscape oil paintings to performance art. At the Beverly Unitarian Church, 10244 S. Longwood Drive, Chicago artist Claire Ashley will use large, colorful blow-up props for performances billed as “The Disco Dozen” that attendees can participate in. Because some artists work in more than one media, the Art Walk is a chance to showcase more than just paintings. For Jennifer Noelle Kolb, who makes hats as well as creates nature inspired acrylic and oil paintings, it provided an opportunity to showcase both her talents. Kolb’s handmade hats will be on display at local artist Judie Anderson’s home studio at 10632 S. Hoyne Ave. and her paintings will be showcased at Horse Thief Hollow. Art Walk Co-founder Sal Campbell said every artist who submitted artwork and paid a $25 fee was accepted, but because the Art Walk has gotten a lot larger than last year — 55 business and venues are participating (up from 38 last year) and 21 musicians will be playing at various locations (up from 15) along with the increase in artists, in the future the organizers may have to create a panel to select winning submissions. One of the challenges Campbell faced when curating the Art Walk was deciding which artists to pair up in each space. For example, At Barney Callaghan’s Pub, 10618 S. Western Ave., formerly known as Keegan’s, because there is a portrait of Barney the dog, a late family pet of the Callaghan family above the fireplace at the pub, Campbell decided to create a “pooch portrait” display, adding portraits of dogs from various artists. In other cases, Campbell said deciding what would be together was subjective. “It’s hard to pin down. Sometimes it is the styles that compliment each other but not the same style. Sometimes it’s the colors and sometimes it’s just pairing artists that I think will like each other,” Campbell said. Campbell said the color scheme of acrylic paintings by Jennifer Noelle Kolb (unframed) were paired with woodblock printings by Tim Vail because they complimented each other well. For this year’s event, all artists were accepted and Wilzcak said while the quality of the work may vary a bit, most is very good and of professional quality. She added that artists set their own prices for their work and keep 100 percent of their earnings. Indeed, several of the artists are well known and make their living solely from their art, and although roughly 75 percent of participating artists are from Beverly and nearby neighborhoods, some like Jennifer Evans of Lake Villa are traveling a good distance for exposure. “I met one of the organizers at an event in Wilmette and submitted some of my mixed-media acrylic paintings, not knowing what to expect,” Evans said. “I just opened my studio in November and think this will be an opportunity for some good exposure,” Evans said. She added that she submitted 12 pieces and all were accepted. Nathan said while she doesn’t scout artists, she welcomes any who feel they have what it takes to make it into her gallery, which features artwork from artists around the world. “I know what works here. I may not always be right, but I usually know. We look at everything, we’re not snobs,” Nathan said. Whether or not an artist can make it from the Beverly Art Walk to one of the most respected and expensive art houses in the city is unknown, but Art Walk organizers are assuring art lovers that they will find a variety on the South Side. “There are paintings and sculptures and tapestries, and all different medias and all different styles. There is something for everybody,” Campbell said. For a full program of the Beverly Art Walk, click here.